Victor Frankenstein is young aspiring filmmaker. He lives in the suburbs with his mom, dad, and his dog Sparky. Victor is a loner, so when his only friend is killed by a car, he resurrects him using the town’s constant electrical storms. He tries to keep things a secret but before long other kids in town are trying to resurrect animals of their own. Hordes of Sea Monkeys, a vampire cat, a giant turtle and others descend on the town fair. 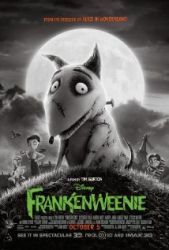 I'm glad I watched Frankenweenie after Vampire Dog (2012), and The Little Vampire (2000). Frankenweenie is totally unafraid to approach horror in a children’s film. I was actually surprised at the lengths it would go to evoke dread, despair, and horror. It manages to balance these darker elements very well with humor. The entire film is shot in gorgeous black and white along some with equally beautiful stop-motion animation. The film is a wall-to-wall homage to horror films past, everything from Frankenstein (1931), to Gremlins (1984), and Gamera (1965). Since my focus is vampire animals this week, the vampire cat has some of the best moments in the film including a wonderfully graphic transformation. The very end of the film drops the ball somewhat. The overarching message of the film is about letting go of those you’ve lost but that underlying statement gets muddled during the monster filled climax. It may have felt like too bittersweet a moment to go out on in a Disney film, but it’s really the only dropped note in a fantastic children’s horror film.